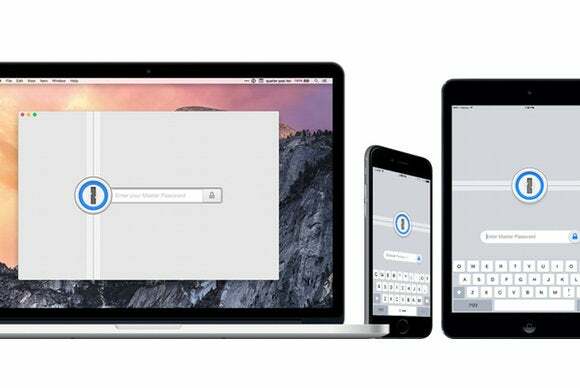 Available for Mac, iOS, Windows, and Android, 1Password is a must-have for desktop and mobile users seeking equal parts online security and convenience. But there’s far more to this software than its single-purpose name might imply. 1Password owners managing only logins and passwords are missing out on tons of other goodies already bundled inside the desktop versions. (The mobile versions require a paid Pro upgrade to unlock some additional features.) Read on and learn how to make your old password manager perform a few new tricks! Sure, 1Password takes the heavy lifting out of logging into your favorite websites, but it does an equally fabulous job filling in payment details for online stores—no matter how many different credit or debit cards you happen to use. Managing credit cards on the iPad is just as easy as passwords with 1Password. 1Password also goes far beyond the basic details of Apple’s own iCloud Keychain, allowing shoppers to store a wealth of additional information, including the issuing bank, toll-free and international contact numbers, interest rate, PIN codes, and cash withdrawal or credit limits. 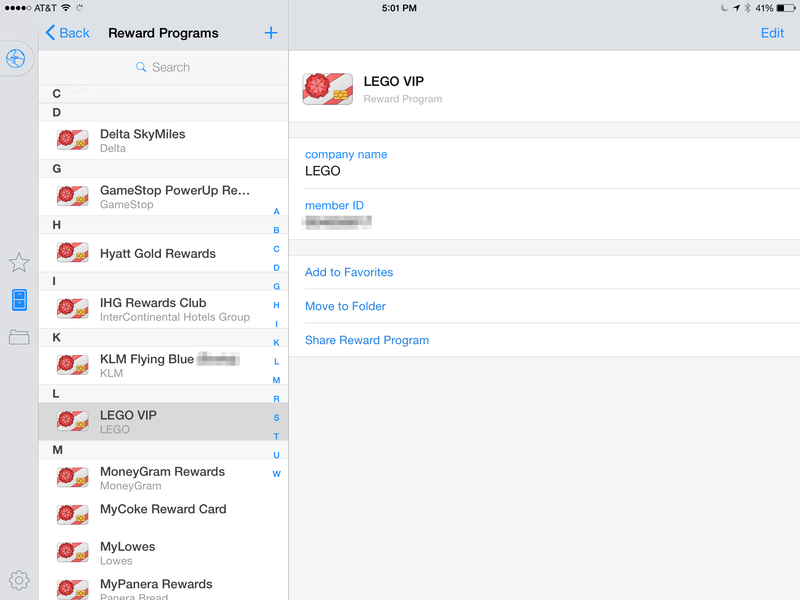 Pro tip: Jot down eligible rewards categories in the Notes field of each card to see where you can accumulate the most points while shopping. We’re big fans of Evernote, but if you’re looking to reduce the number of apps on your devices, 1Password’s built-in Secure Notes could be just the ticket. 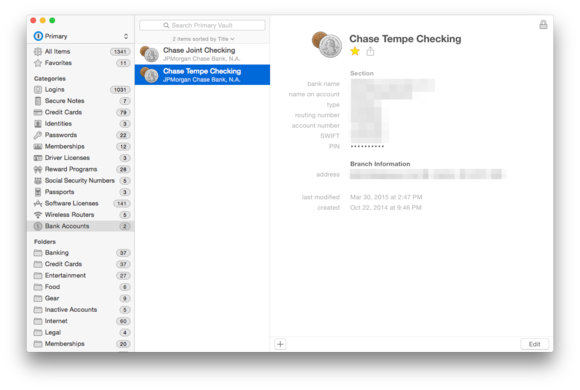 While not as robust as Evernote, 1Password secures notes with the same tamper-proof authenticated encryption used for passwords, along with any files attached to those bits of data. Like other 1Password categories, users can also add tags, making information easier to find in a search. Add a secure element to taking notes by using 1Password instead of Apple’s built-in app. 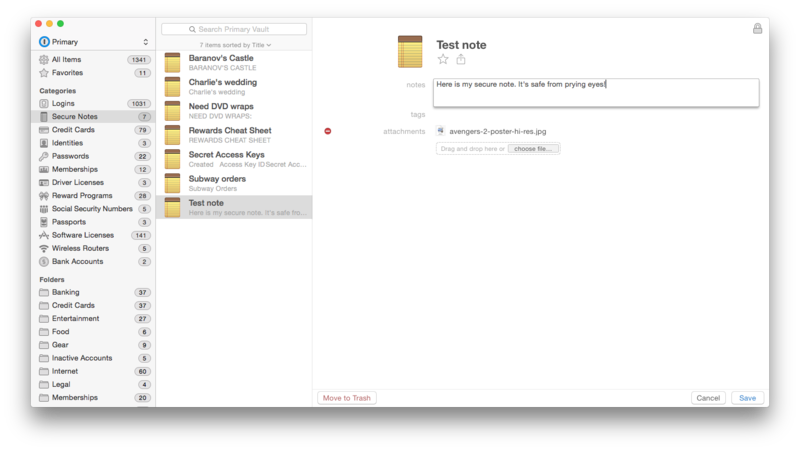 Pro tip: Tick the star icon to add frequently used notes to your Favorites for faster access. Between frequent flyer programs and retail loyalty cards, key rings are used less for unlocking doors and more as a place to store plastic barcode widgets. But how many of those do you actually need to carry in your pocket? How about zero? Unload all the plastic from your key ring by porting those loyalty card numbers to 1Password instead. 1Password includes a pair of convenient Memberships and Reward Programs categories for this very purpose, which can be used to enter all of those digits and potentially free up space on your keychain or in your wallet. Pro tip: Next time you rent a car or book a flight online, leave those cards at home—you’ll have them safely stored inside the mobile app, should you need to look them up again. Between work and home, many of us now have more than one identity online—for example, freelancers might prefer to have payments and related correspondence sent to a work address (even if it’s just a P.O. box), while personal items such as credit card and utility bills go directly to a house or apartment. You don’t have to have a secret identity to make use of 1Password’s Identities feature. Web browsers typically aren’t great about remembering credentials for more than one user at a time, but 1Password is more than up to this task. Simply create a separate item in the Identities category, give it a unique name, and the next time you need to choose a specific online identity, just select the corresponding entry. Pro tip: Set up the initial identity, then use the Duplicate option and edit accordingly to save keystrokes for new entries. We’re not yet living in a future where smartphones can replace physical identification cards such as a state driver’s license or government-issued passport, but that doesn’t mean it’s not a good idea to have the information represented on those documents securely backed up, should they become lost or stolen. Use 1Password to keep a virtual backup of passports and ID cards for the entire family. 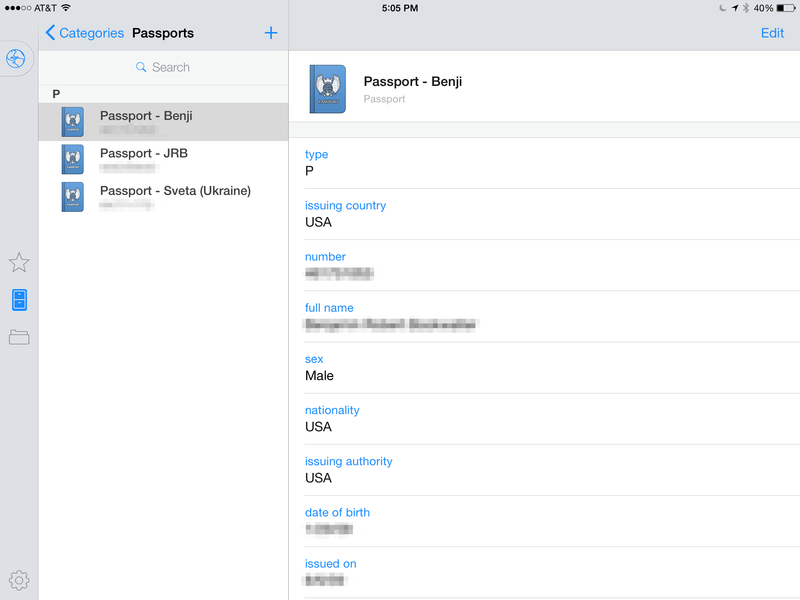 1Password once again comes to the rescue, with dedicated Driver’s License and Passports categories specially built for storing details from these sensitive documents. Pro tip: Scan your originals and attach to their electronic counterparts, rather than carrying around photocopies while traveling overseas. Although the Mac App Store has largely eliminated the need for serial numbers or license keys for new software, there are still plenty of titles sold outside of Apple’s virtual storefront, with 1Password is a great way to manage important ownership details. 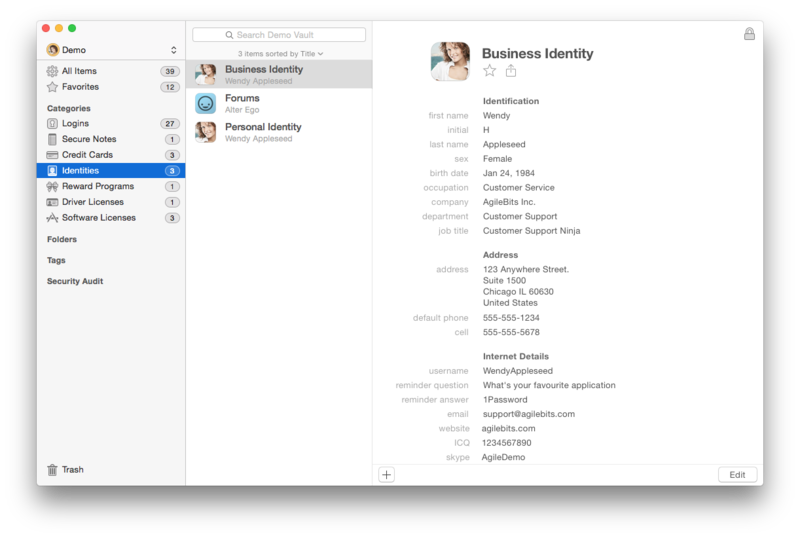 1Password can also wrangle serial numbers and license keys for software purchased outside the Mac App Store. 1Password can keep track of version numbers, purchase and support information, and how much the software cost, all with a colorful icon pulled straight from the application itself. Pro tip: Create new entries quickly by dragging the application onto Software Licenses, which also extracts the current version number at the same time. By this point, it shouldn’t be much of a surprise to discover 1Password includes a category dedicated to storing Social Security numbers—the nine digits all Americans are assigned soon after birth, and which are now required when verifying employment, borrowing money, or checking a credit score. 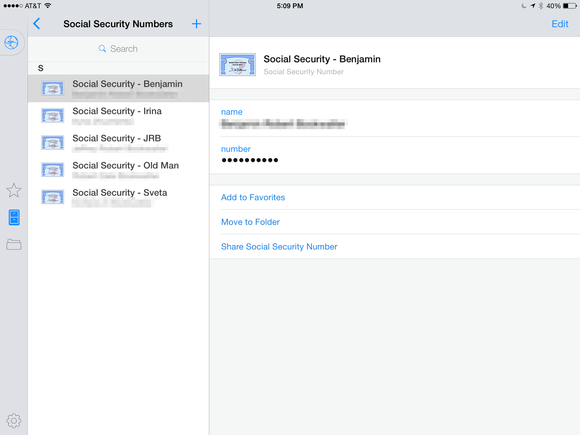 Keep your Social Security Number safe at home and let 1Password remember those digits for the next time. Many security experts advise consumers to keep original Social Security cards safely locked away at home, so if your memory isn’t what it used to be, rely on 1Password to get the job done instead. Pro tip: Add entries for the entire family, including elderly parents or grandparents under your care. Not everyone needs more than one bank account, but for those who do, 1Password is once again a godsend, securely storing account, routing, and PIN code numbers for checking or savings accounts—particularly handy for a new generation of bank customers who have little need for paper checks. 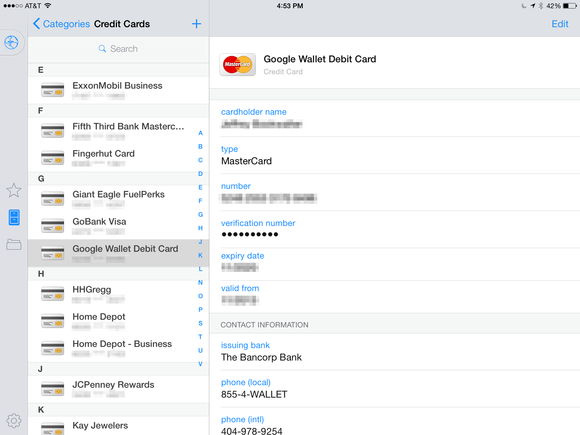 No matter how many bank accounts you have, 1Password will keep their details safe and secure. Pro tip: Don’t forget bank address and SWIFT codes, which you’ll need prior to receiving domestic or international wire transfers.